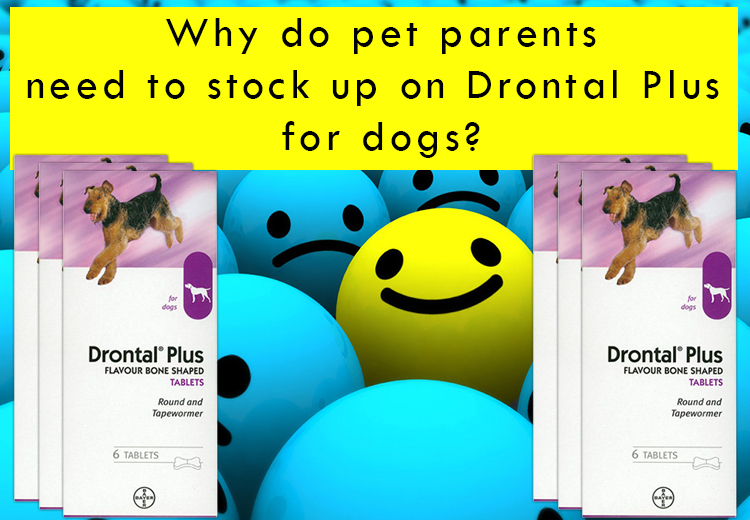 Why Do Pet Parents Need to Stock up on Drontal Plus For Dogs? Dogs start scratching when infected by fleas or ticks and give us hints of being unhealthy. But what if your dog has become a home for intestinal worms? These worms usually do not show any signs of infection till they grow. How will you prevent those worms from growing without any hints laid by your darling pet? Drontal Plus for Dogs is a perfect treatment to get rid of all kinds of intestinal worms from your pet. It has a great capacity to prevent the growth of roundworms and tapeworms. Round worms are further categorized into Ascarids, Hookworms and Whipworms. All these worms will have no residence if your dog will be treated with these treaty chewables around every three months. Your dog can be infected any time, so to stay ready, stock Drontal plus efficiently. These chewables are composed with praziquantel, pyrantel pamoate and febantel. Look out for these symptoms! •Dull coat due to mal-nourishment. Dull coat may also appear due to fleas and ticks. •Infections caused by these worms may lead your pets to vomiting or diarrhoea. Worms can be visible in their vomits. •Your dog may scoot and wash their bottoms frequently due to itching caused by the worms. If you are stocked up on these tabs, wouldn’t it be easier to treat your beloved dog against these nasty worms? Any dog, weighing over 2lbs and 3 weeks of age can be treated with this treatment. It is an effective broad-spectrum dewormer eliminating all types of roundworms and tapeworms. They are chewable tablets which can be given easily to your beloved pets. It has to given in single doze. It is available as 22.7mg chewable tablets for small dogs (2-25 lbs), 68mg chewable tablets for medium dogs (26-60 lbs), and 136mg chewable tablets for large dogs (45 lbs and over). Cautions before going with this treatment! •Dose your dog as directed by the veterinarian. •Do not give these chewables if you are already treating your dog with some other dewormer. •Check whether your dog is allergic to this treatment and then go ahead with it. These worms are needed to be treated straight away. Regular dosage of this treatment will be a great measure against worms. It is every pet parent’s duty to take care of their dogs and give them a happy and healthy life. Won’t you love to stay cocooned with your dog fearlessly? Order Drontal Plus for dogs today itself and keep your dogs worm free!